On 22nd June 2014, I made beef steak at home for the first time in my life. One of hubby’s favorite meals is beef steak but we usually have it at restaurants. This time I thought of making it at home. Since it was the first time I was cooking steak, I used rather inexpensive packaged beef sirloin meat available at any supermarket in Japan. I seasoned both sides of the meat with lots of freshly ground pepper and salt. Meanwhile I made the frying pan very hot, added about two tablespoons of oil, and placed the meat on the pan. After about one minute of cooking, turned over the meat carefully and cooked for another minute or so. I let the steak char a bit on the outside. Then I placed the steak in an oven toaster preheated to 255 degrees Celsius for about one minute. And the beef steak was ready to eat! Hubby likes his steak cooked medium rare but that day it was well done as I was not sure about the time needed to cook the meat. Turned over the meat and cooked the other side. We can see that the meat is slightly charred. I placed the steak in the oven toaster. The toaster looks rather dirty in the photo! We had the beef steak with garlic-soy sauce. For making the sauce I crushed a few cloves of garlic and sauteed it for about 30 second in half tablespoon of oil in a frying pan. Then added 2 tablespoons (TBS) of soy sauce, 1 TBS Mirin, half TBS sugar, and some freshly ground pepper. I let the mixture boil for a minute or so, and the sauce was also done. I made mashed potatoes, broccoli, and corn on the cob to go with the beef steak. I just micro-waved all these vegetables and it took only a few minutes to get them ready. The previous day I had baked bread at home. So I added a few pieces of bread to go with the meal. In addition, I made Miso soup also as it is an integral part of our everyday meal. 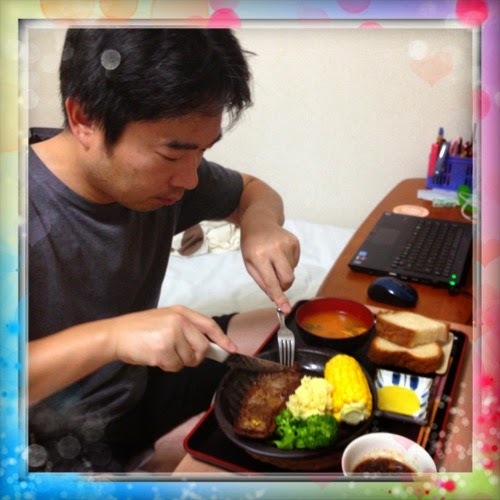 Hubby really enjoyed the meal of beef steak. He says it was delicious. In fact, he wanted to eat more but we had bought only two pieces of beef meat that day, so I gave him my portion too. It was nice to see him so satisfied after having the meal. Since that day, I have cooked beef steaks two more times and more or less have optimized the time required for cooking medium-rare steaks. Beef steak is surely a new recipe added on to my regular cooking menu. Hi Manisha. We love steak as well. Your one looks delicious!! Thank you very much for your comment Rahul. Thanks for the comment Anima. I have more or less optimized the conditions for cooking the meat. Thank you very much for sharing the site. It is very useful for me. Yeah, nowadays hubby enjoys the beef steaks every weekend.